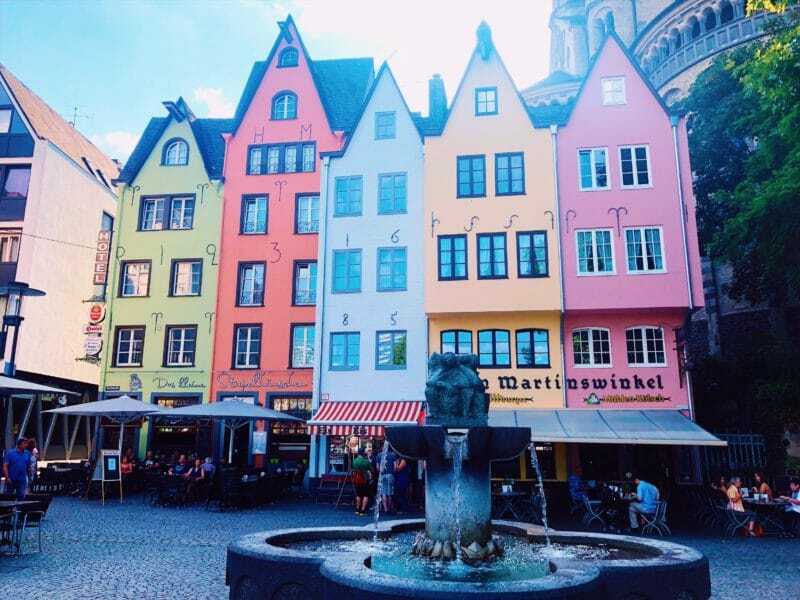 If there is one thing my camera roll and Instagram feed look after a visit to Cologne it’s colourful. Even when it rained on my first visit a could of years ago the pastel colours of the buildings stood bright against the grey skies, and in the summer they look even better against the bright blue. 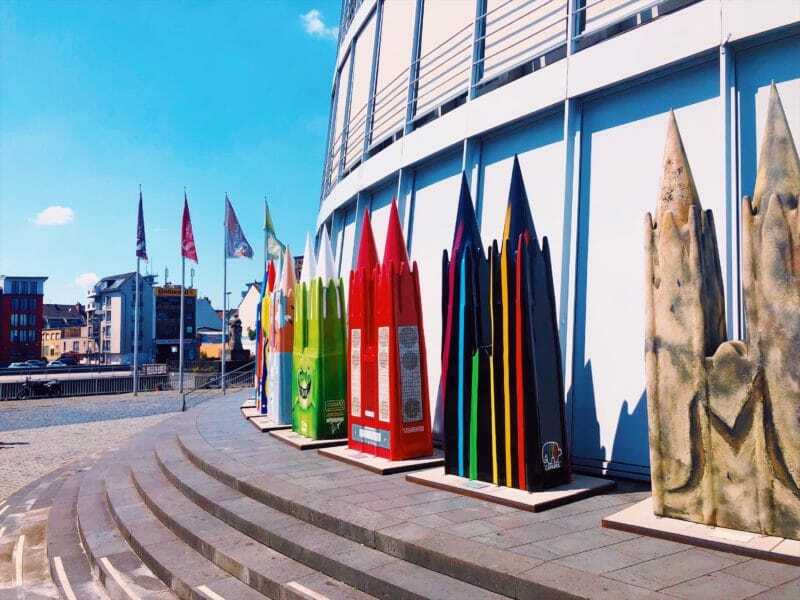 Here’s some of the most colourful spots in Cologne, and nearby Bonn and where to find them. 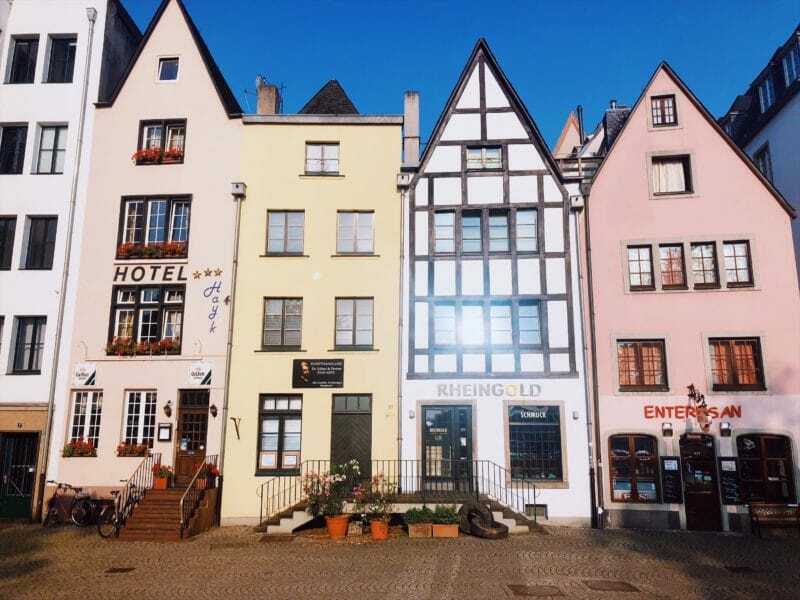 Starting with the most obvious, the row of coloured houses in the centre of the Old Town, that have been there for decades, even if they have been rebuilt over time. 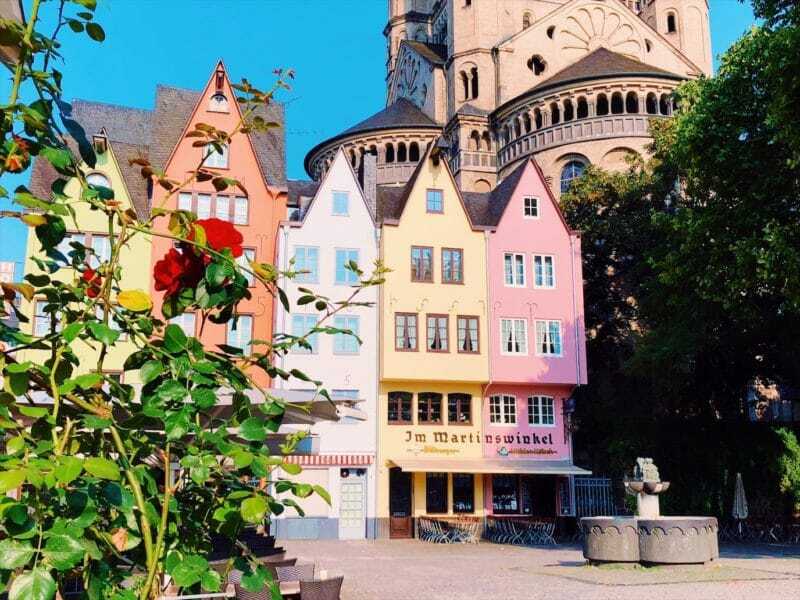 Visiting this row of pastel beauties is on my list of 6 things you HAVE to do in Cologne. 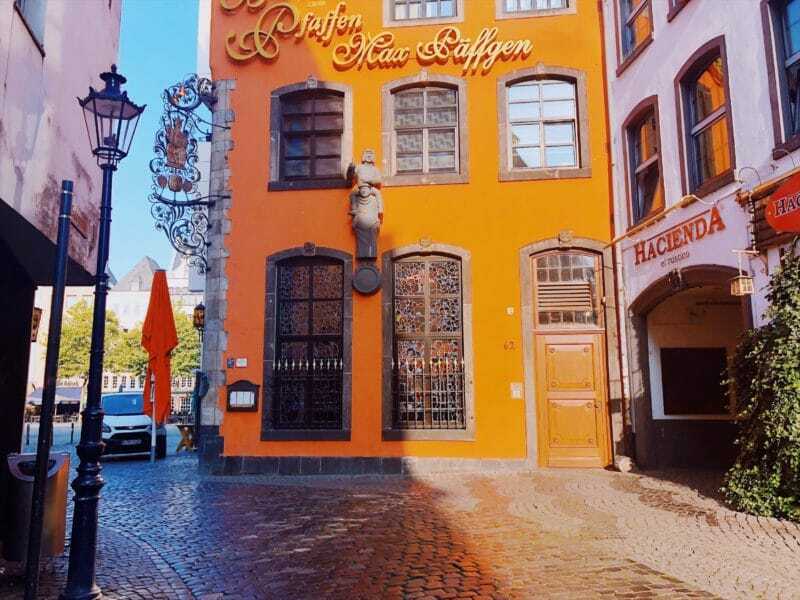 The restaurants serve traditional German food, especially the orange house which also has a detailed photo timeline of the history of the houses. The pink house on the end really makes the most of it’s little side gate and seating arrangement outside, and the blue house is an ice cream parlour with a lot more flavours than you would expect to find in somewhere so tiny. 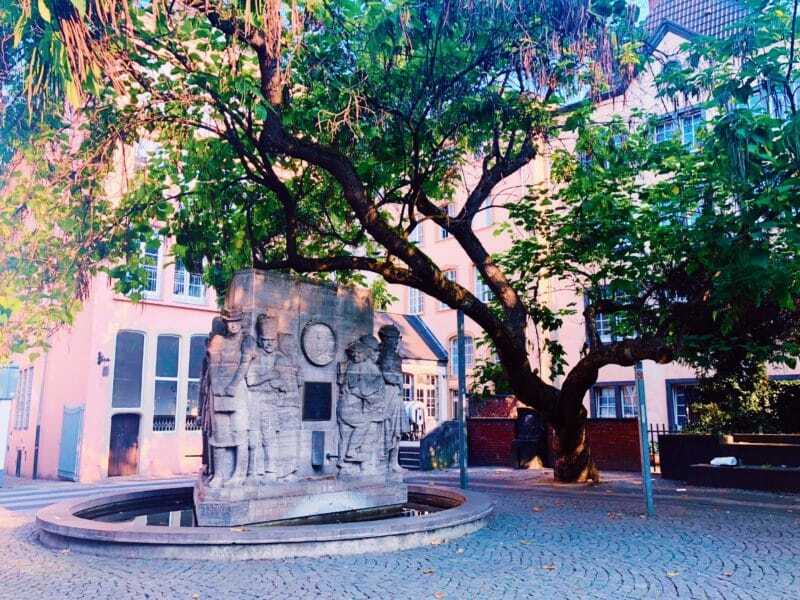 They sit tucked back slightly from the main river promenade, and form the smallest market square in front of the St Martin’s Church and little fountain. 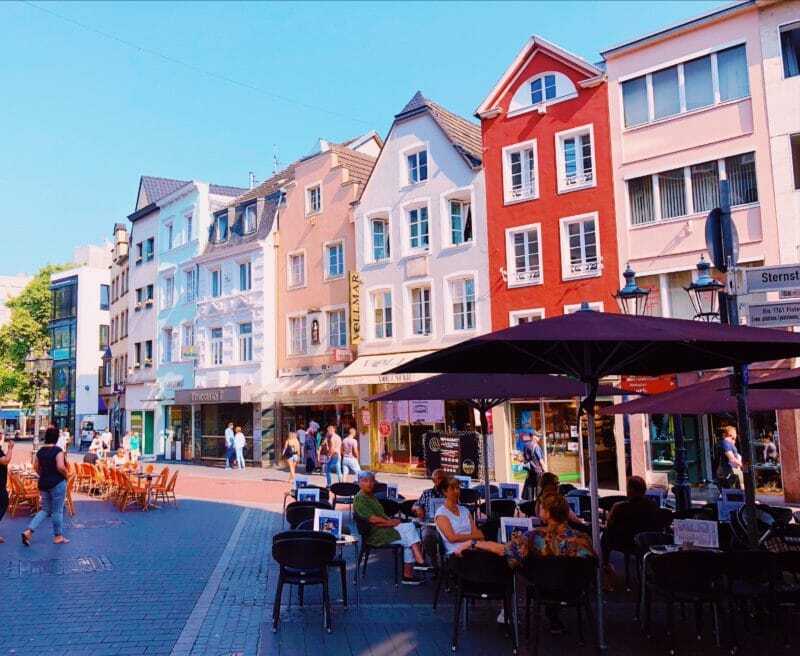 Further along the river you’ll find more restaurants and some hotels that also show of colourful exteriors, with timbered walls and patterned window shutters. 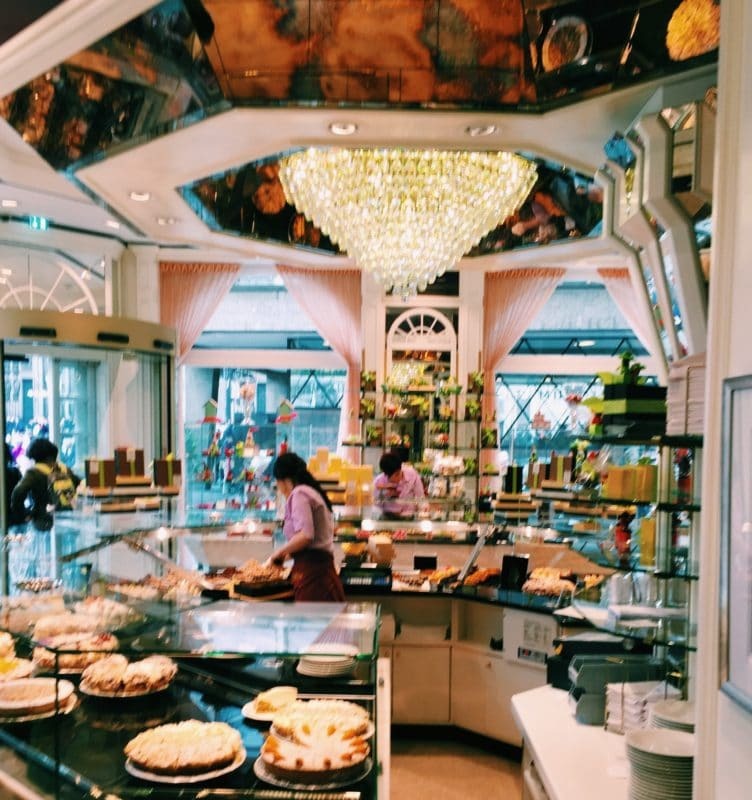 They’re not quite as quaint as the group by the market square, but they still paint a pretty picture with their mismatched tones and bright umbrella shades outside to tempt in passers by. 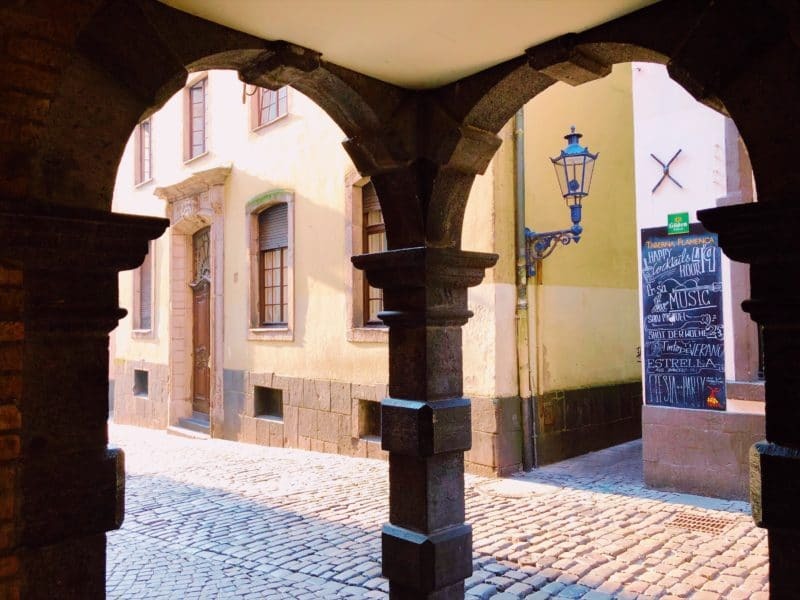 Delving deeper into the old town from by the river and you’ll come across some of the most gorgeous little side streets and cobbled alleys just waiting to be explored. 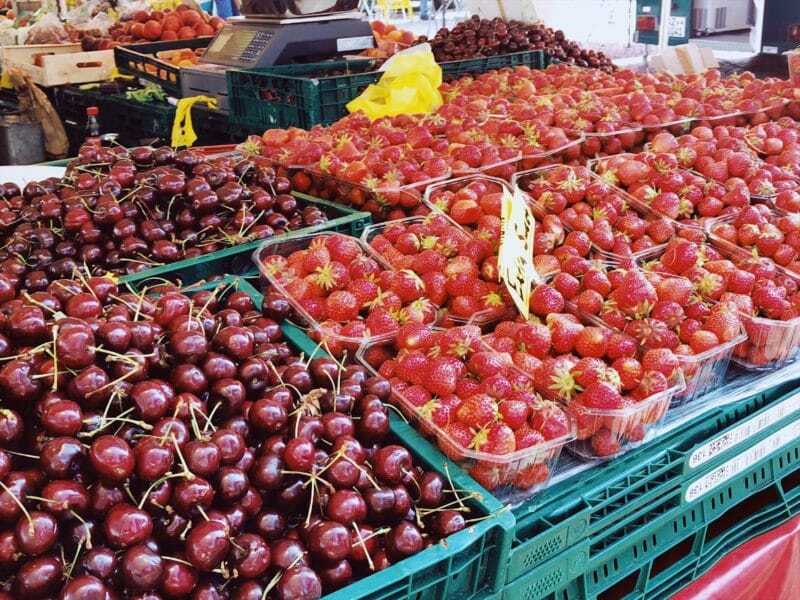 The old town is full of them, and they’re just as bright and colourful as each other. 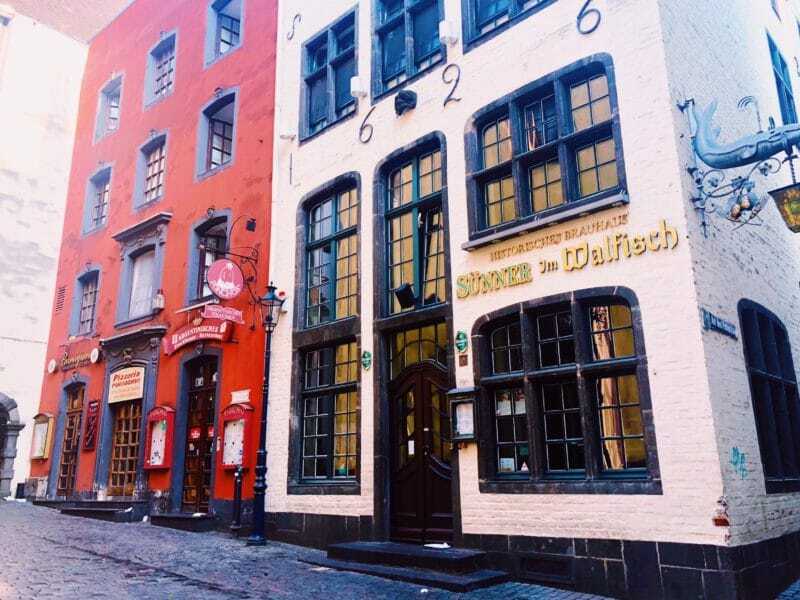 If you’re looking for traditional bier houses then the old town is full of them, and the crowds spill out onto the streets in the evening with folk drinking Kolsch. To compete with their neighbours, a fair few of them have gone for the bold exteriors. Wandering through this area first thing gives a totally different perspective than later in the day when the crowds are out, and definitely at night when its very lively. 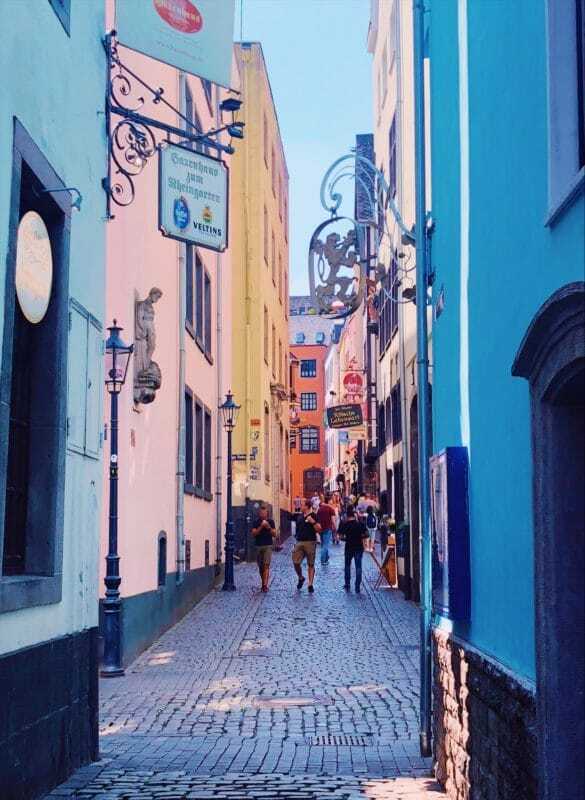 It’s such a small area so don’t be scared to walk down the side alleys and under the little stone arches, there’s some gorgeous yellow buildings, and a little pink square at the end of them. 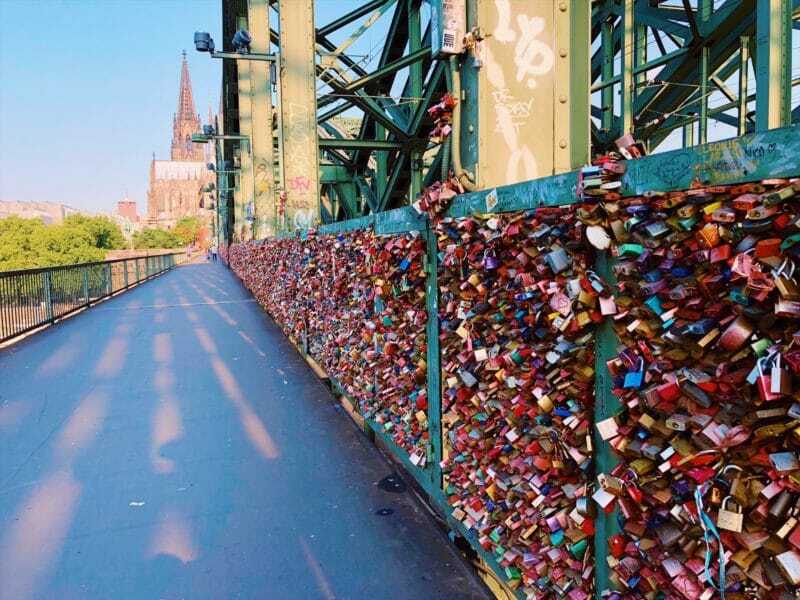 The love locks that line the length of the famous Hohenzollern bridge are a sea of colour all locked on top of each other, and they make a great photo looking back along the bridge to the Dom Koln cathedral with its iconic spires at the end. 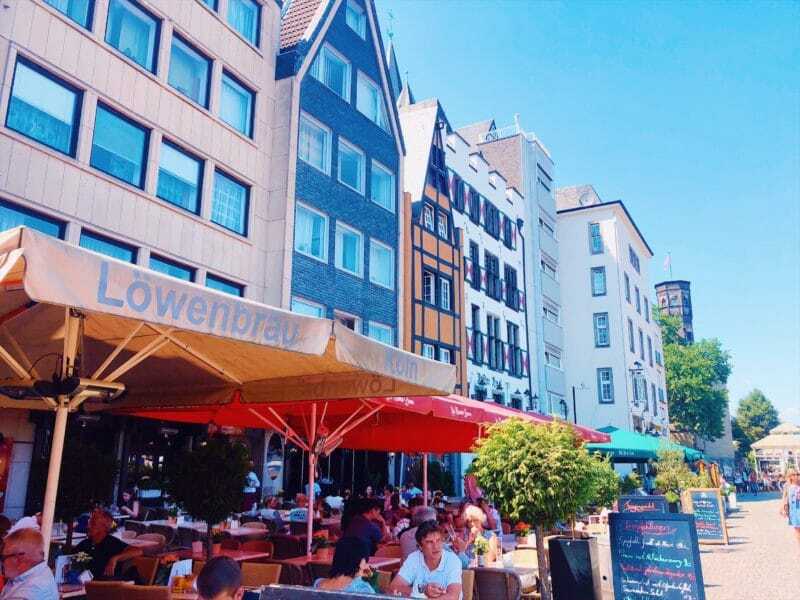 Directly opposite the main entrance to the enormous Cologne Cathedral is Cafe Reichard, a fabulous cafe and restaurant open from breakfast right through to dinner. Inside it’s a delicious shade of powder pink, and outside the bright red flowers line the outside terrace. Gorgeous! 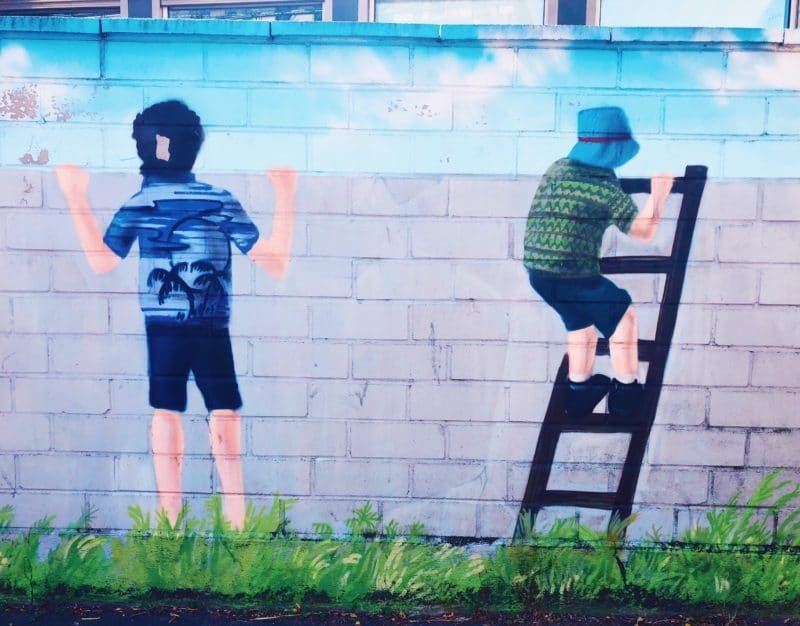 Like most German cities I’ve visited, street art is a big feature. 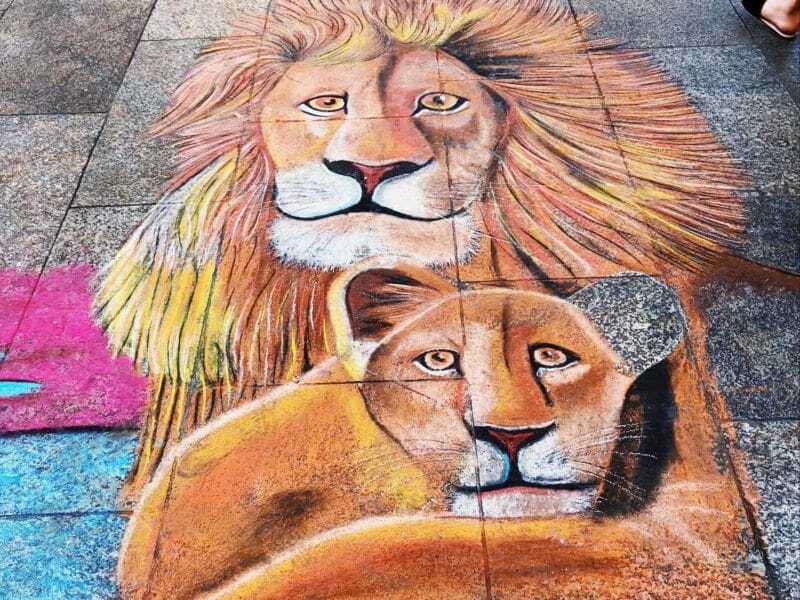 There are a number of paintings on blank walls and the side of buildings, as well as artists drawing on the pavements outside of the cathedral. 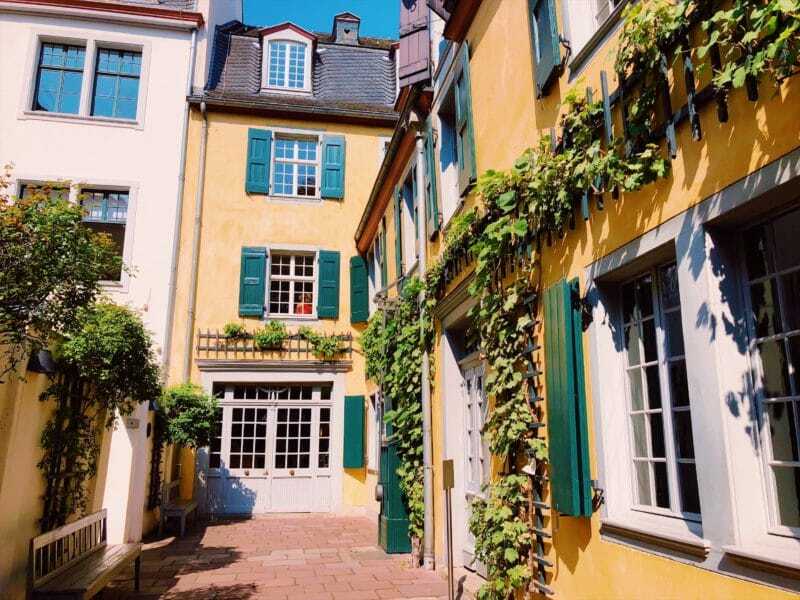 The neighbouring city of Bonn is just a short train ride away from Cologne, and it too is full of it’s own colourful little spots that make a day trip worth it just to wander around. 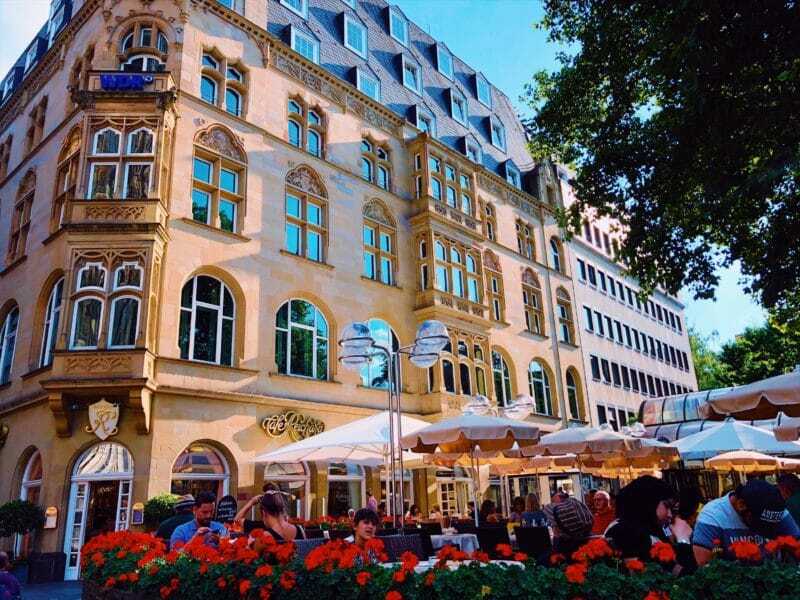 This lemon coloured building is the old post office, but the building itself used to be a palace, Fürstenberg Palace that dates back to the 1800’s. 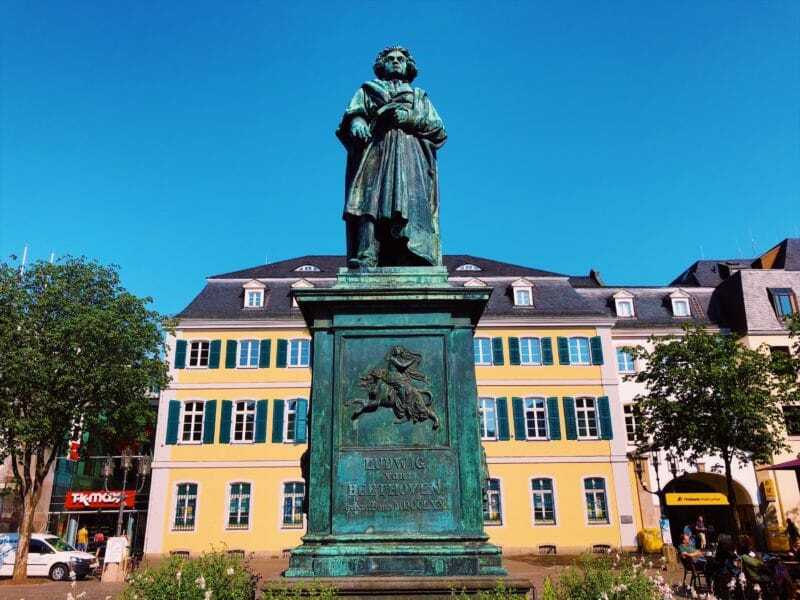 Now it forms the backdrop to the giant bronze Beethoven statue that stands in the middle of the square. 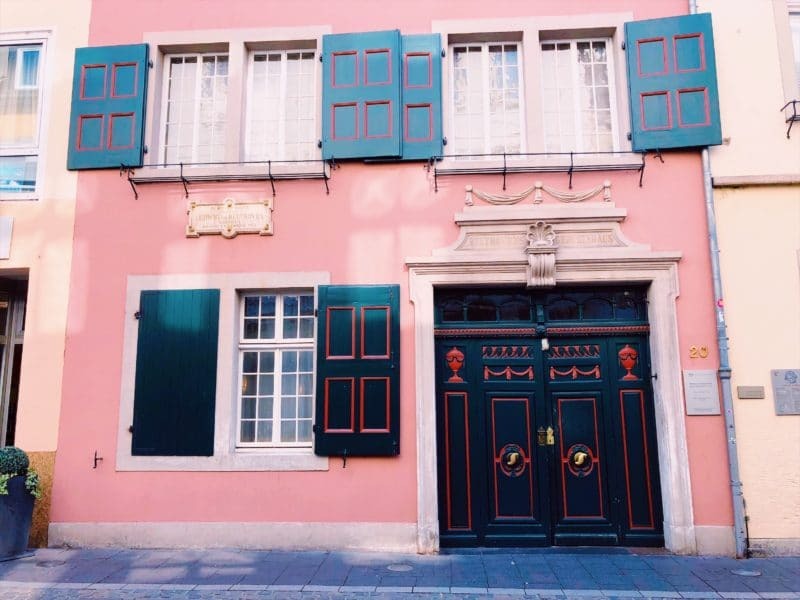 Being the birthplace of the famous composer, Beethoven’s house would be an attraction regardless of what it looks like. 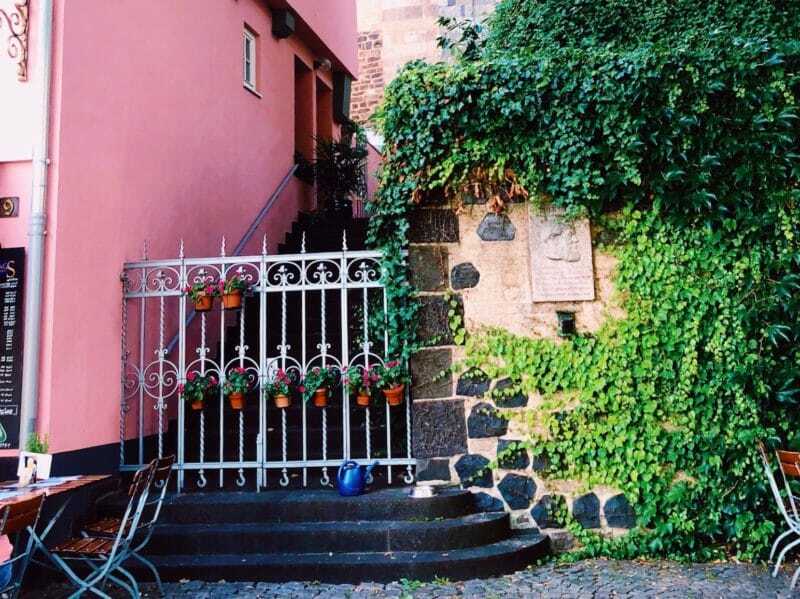 It’s even better though that the house is a wonderful pink colour, with green trimmings! That’s what it looks like from the front, but if you go inside you’ll find that the rear of the house is bright yellow. You can sit in Beethoven’s back garden and admire it. 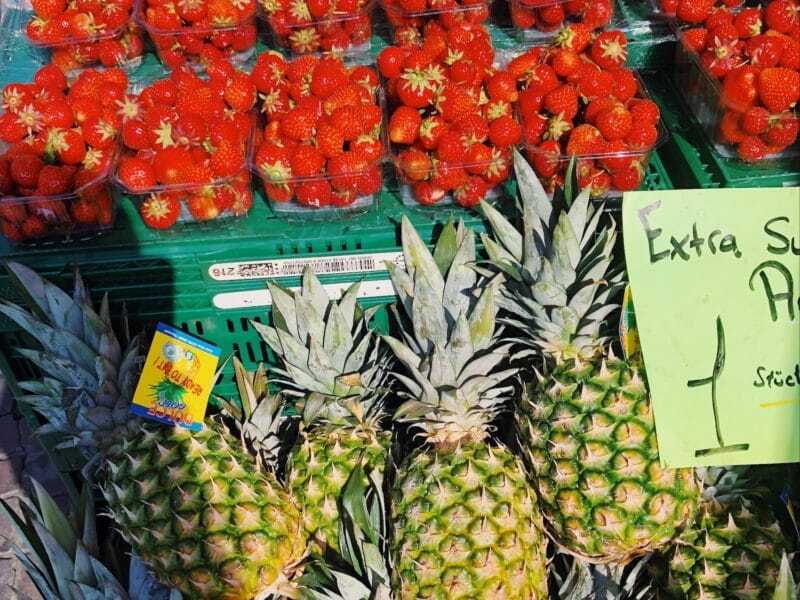 The farmers market arrives to the market square every Saturday, and brings with it a full array of brightly coloured fruit and veg. 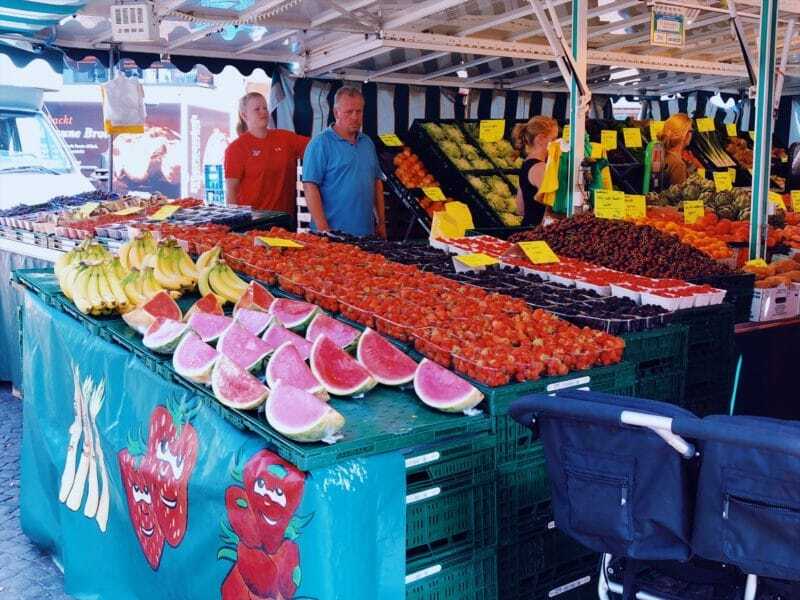 Wander among the different stalls for as many strawberries, cherries and watermelon you can stomach. In the same square as the market, the old town hall stands proudly at one end. Inside it has the Lord Mayor’s office, but the outside is a beautiful display of white, pink and gold. 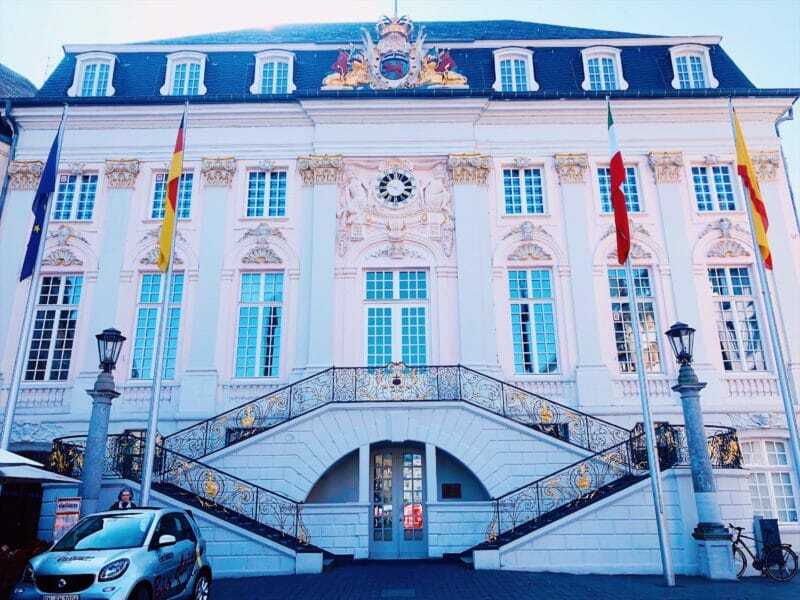 It’s the most extravagant building in Bonn, looking the most ornate, even if it isn’t necessarily the brightest. 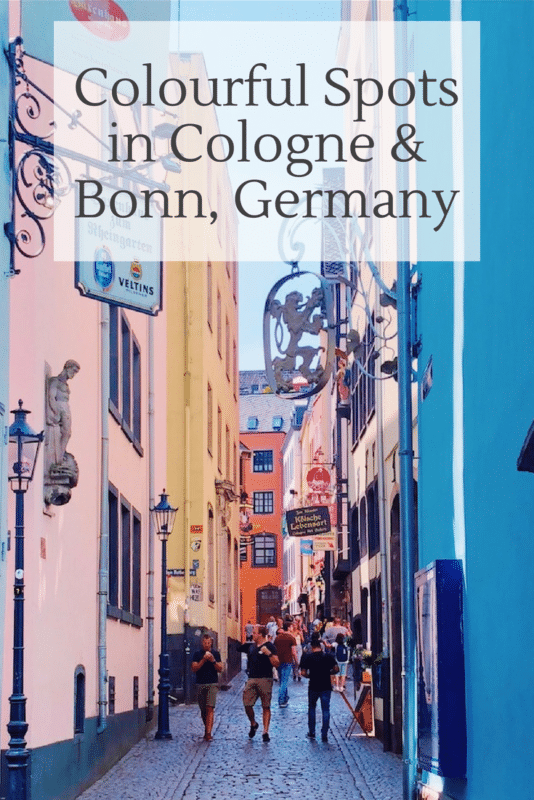 I wish I had your guide when was visiting Cologne last year. 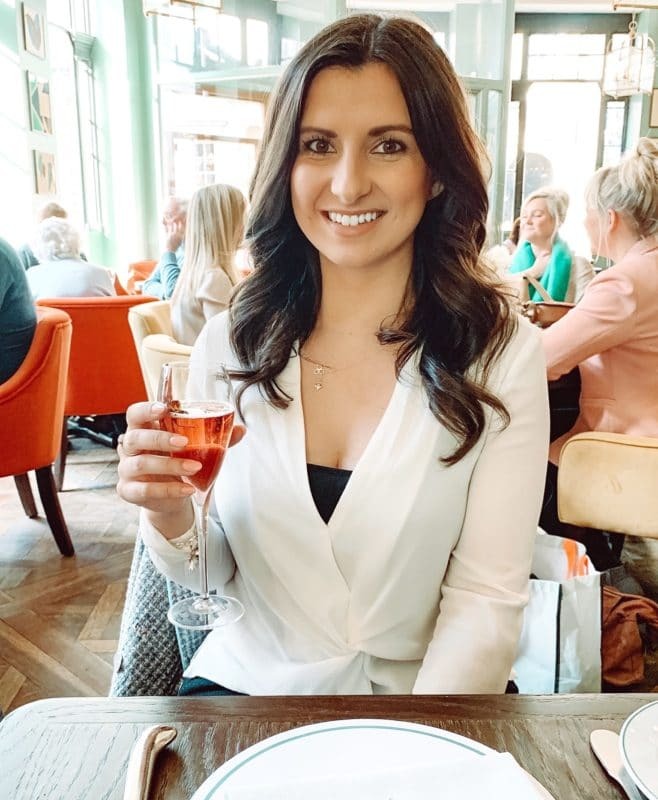 I don’t know why but this city didn’t impress me at all, possibly because I was in the middle of a cold snowy season and didn’t go to all the places you mention above. I’ll bookmark your page, it will definitely come in handy in the future!